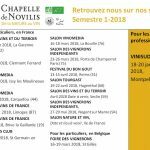 2016 HARVEST : TOP DEPARTURE FOR NOVILIS CHAPEL! Harvest 2016, it is the top departure CHAPELLE of NOVILIS! We are finally there the harvest 2016 will begin Monday, August 29 for our team of 14 people. The fruit of a year of work in organic farming: It is weeding without herbicide, mechanically in our old vines and manually in our planters. It is using natural products to treat diseases of the vine. Feeding our soil with sheep manure and compost of grape marc and finally doing all the work of the vineyard by hand, until the harvest by hand and the grapes are then sorted by hand one by one. a.